Ever since I can remember, choosing the Best Fujitsu Scanner was always a bit difficult. Seeing their lineup with various models and shapes can be a little bit intimidating at first. But as you go into them, you start to realize that it actually makes sense. We will focus on the FI models and the Scansnap models. You will be able to choose the appropriate scanning equipment for your requirements. If you need a Fujitsu scanner with twain driver you will have to look over the Paperstream IP driver first. This is the heart of the Fujitsu scanning equipment. It now comes bundled with almost all of the scanners built by the company. PFU, the Fujitsu company that builds the scanner sold by the brand are now focusing on standardizing the Paperstream IP over their entire range of equipment. This makes it easier for customers to upgrade to a higher volume machine, or even implement decentralized scanning. 3.1 Fujitsu FI 7160 and 7260 – A4 small office production scanner. 3.3 The Fujitsu FI 6400/6800 – High volume production document scanner. The twain driver is more or less an API or communication interface that allows software to communicate with digital imaging devices, such as scanners. While such technical details are not of concern to most users, lately this is changing. With the evolution of custom-made software, companies want to integrate their scanners with their own software. This is why it is becoming more important each day. Twain allows for customization of features, rather than reprogramming the communication between equipment and software. Basically, what it helps with is using the special scanner driver directly with your software without redesigning everything from the ground up. Fujitsu has gone a step further with this idea. The Paperstream driver is standard on all FI models and it sometimes works with some Scansnap models. PFU builds equipment for different needs. These are focused on a couple of factors such as portability, decentralized scanning, and high volume scanning. Scansnap is the trademark of scanners the company uses for affordable and low volume scanning solutions. These are focused on the ultralight compact models, like the Scansnap IX100, to the special bound document scanner the SV600. In fact, you can check the price on Amazon here, for the entire Scansnap Range. Fujitsu SV600 is probably the most interesting prospect out of the entire Scansnap range. While it can scan bound documents it is not a full on book scanner. Quality and longevity are not the same compared to a 15000 dollar book scanner. But at the same time, it does cost more than 20 times less. It allows for easy scanning of bound documents up to A3 size. You just lay the book open in the normal reading position and hit scan. Scanning speed is quite decent, around 3 seconds for each scan. A quick flatbed scanner can do the same speed but it’s more of an effort to use. Fujitsu claims you can also bundle it to the Fi series scanners. It’s a very interesting feature and complements the ADF scanner quite nice. It is also quite small for what it should do. Book scanners are usually heavy and big. Of course, keep in mind, the Fujitsu is not a professional book scanner. Fujitsu IX 100 is a portable document scanner. It’s not necessarily fast, won’t do large volumes, but you can carry it around. It can work on a battery and also has wireless scanning. And the price is very low. If what you use it for brings in some value, it will feel this scanner is for free. The trademark for professional Fujitsu scanners is FI. Under this trademark, Fujitsu sells the range of equipment that can process larger amounts of documents than the Scansnap range. Mobility and portability are less of a worry here. Throughput and efficiency is the key. Fujitsu FI 7160 and 7260 – A4 small office production scanner. I must tell you from the start that this model is actually called the FI 71xx or 72xx. This is because you can also get a 7140 or 7180. 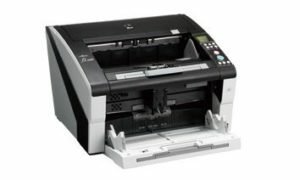 The FI 7160 is the best choice between them, with a fast enough scanning speed and decent pricing. What we like about this model is that it features most of the things that Fujitsu sells on production scanners too. The high quality capturing unit with CCD is the first one. The quality of the image is just incredible. It will easily match a 10k Kodak scanner and beat a Canon or a Panasonic scanner any day. It features Paperstream IP driver and the Paperstream Capture software. Besides some small options, you get the same driver as production machines. The general feel of the machine is very good and feels very well put together. You can feed the ADF while scanning for better productivity. On the FI7260 you also get a flatbed scanner included. This is a great feature. There are some things we don’t like about this scanner. The machine only scans A4. You can scan A3 by folding the document and auto stitching but it is not very practical. We would also like a bigger ADF, but considering that you can feed it while scanning it should not be such a problem. The price of the FI7260 is a bit too high, but I guess it depends on your needs. Theoretically, it should pay for itself quite quickly. I am a big fan of the FI 6770. But when they replaced it with the FI 7700, something good suddenly became something incredible. The FI 7700 is probably the best scanner on the market at the moment. It just looks like a very well polished product, that features years of customer needs and demands in one package. A scanning speed of 100 pages per minute. This is both rated speed and a speed you will achieve during production days. It just scans and scans without too many multi-feeds. The ADF was increased to 300 pages. This is now a great addition and is one of the big improvements over the older FI6770. The quality of the scan is just incredible. You just have to open the top of the scanner and see the camera area. It has 2 LED light sources for each side, which make for even illumination and almost perfect white balance. The auto-manual scan clamp on the scanner makes it so fast to scan mixed or even damaged documents. The switch between auto feed or manual feed takes 1 second. Although everything seems perfect, there is one thing that changed. The price seems a bit higher than for the 6770. Still, are you getting an improvement over the 6770? Yes, this is for sure an improvement. Not even a question. So yes, it might be worth it to pay the difference. At the same time, I am curious if Fujitsu is actually doing this and discounting the 6770 stocks they currently have so they can empty them. So it might be that in a year or so, the 7700 will actually be cheaper. The Fujitsu FI 6400/6800 – High volume production document scanner. Yes, now this is a classic document scanner. Not that it’s old or has old technology. But it can scan over 50.000 documents a day, every day, for the rest of its life. Really, this scanner has been built to scan. If you own it and you’re not using it, you are definitely losing money. This is a heavy duty machine that looks like it could sit in an office. It will scan all day but is not a metal thing you just want to hide when not working. The FI6800 is still a heavy machine at 34kg but it looks a bit more compact than the ones I mentioned before. It just feels like you could use it in an office. Even so, it can do a lot of scanning. The scanning speed is 130 pages per minute. Feed it and it will “eat” the pages. The speed and consumables allow you to easily scan even 50.000 documents every day. It’s easy to maintain and service. Besides consumables, you won’t change that many parts. Regular cleanings and you are good to go. It does not have a flatbed unit to attach to it. Fujitsu still doesn’t sell it which is weird, to say the least. The price is significant considering alternatives that do feature a flatbed scanner. With the new FI 7700, is the 6400 still worth it? We think that at this moment, no. For most of us, the best scanner from Fujitsu will be the FI 7160. It is the cheapest scanner and will handle documents up to A4. This will cover most of our needs and should handle our daily requirements with ease. If we are thinking about larger archives, then we should go with the FI7700. It is such a good scanner that it will easily handle most production type projects. It was only launched last year so it features a lot of gizmos and interesting features. If you are into production scanning, then you will definitely need something like the FI 6400 or the FI 6800. These are high volume machines and if you are into them, you most likely know quite a lot about scanners. As a general conclusion, our winner is definitely the FI7700. Still, considering the price, we should also mention the FI 7160 which remains the best choice if you only need A4 documents. The FI 7700 is such a big improvement over the already great FI 6770, that it can easily compete with the FI 6800. It offers almost the same features and it will more or less do the same volumes every day. The FI 7160 is fast enough to process decent volumes of documents. It costs under 1k which is just incredible considering that you are getting professional features and quality in such a small box. We have two separate reviews for the FI 7160, one on being the only professional scanner under 1000 dollars and the other on scanning photos with the 7160.